Laced with the powerful citrus fragrance of yuzu, this is a tonic that can be appreciated all on it’s own or used to bring some citrus zing to a gin or vodka. Bracingly tart juice with a strong flavour yuzu manages to combine mandarin, lemon and grapefruit yet remain a complex flavour all of it’s own. In this tonic the yuzu delivers a floral, aromatic and refreshing flavour. Yuzu trees, originally from China, are prevalent in Japan where the zest and juice is used in many sauces and dishes, both sweet and savoury. The yuzu in Qyuzu is grown and bottled in Spain using premium quality fruits ripened in Mediterranean sun. Now yuzu has reached Europe mixologists have been quick to spot its potential for lifting cocktails and mocktails. 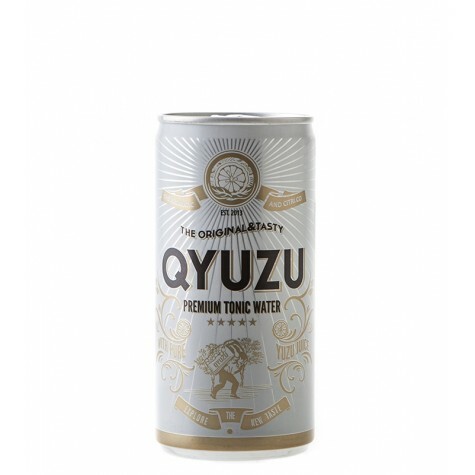 Perfectly balanced this tonic captures all that flavour in a can bubbling with the original zing of fresh yuzu. Described as "uber-fragrant" yuzu fruits are a natural cross between a mandarin orange a.. This boutique craft gin in the Twisted Nose range from Winchester Distillery combines ten botanicals..
Sudachi trees are grafted onto specially selected rootstock (Citrange – C35) to allow them to ..